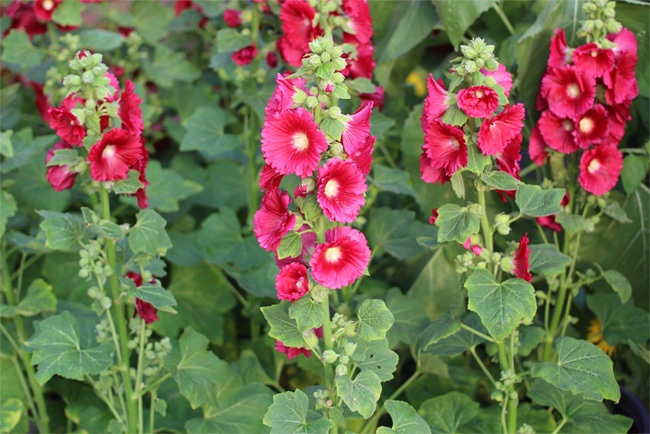 The hollyhock is a garden plant famous for its beautiful, vividly-colored, ruffly flowers. Though it’s an annual or a short-lived perennial, a healthy hollyhock seeds so abundantly that a gardener can expect many years of bloom. The plant grows to between five and eight feet tall and is usually raised from seed sown in well-drained soil in full sun. Hollyhock has a reputation for being temperamental, and many gardeners might be hesitant to transplant it. However, this can be done according to both Garden Guides and Burpee. Perennial hollyhock seeds can be planted outdoors in the summer, while annual seeds should be planted in indoor pots in February. The pots should be placed in a sunny spot in a room that’s at least 70 degrees Fahrenheit. The covering of soil should be light because hollyhock seeds require sunlight to germinate. The soil should be kept moist, and the seeds will come up after 10 days. They take a bit longer when they’re planted outdoors. The seedlings shouldn’t be transplanted until they have at least four leaves and not until the air temperature outside is at least 50 degrees F.
The seedlings should be transplanted into another sunny spot, preferably beside a wall that makes a good backdrop for the plant’s height and showy flowers. Weed the soil, then amend it with compost if it needs it. An ideal soil for hollyhocks has clay, sand and lots of compost, including rotted manure or leaf mold. The soil should be worked down to at least 6 inches and as much as 10 inches if it’s a heavy, clayey soil. Remove the seedling gently from its pot. Crumble the soil from the root ball, careful not to damage the tap root. If the plant has been growing in the ground, use a trowel to dig it out, but be gentle. Make a hole for the seedling in the soil, slide the roots of the seedling into it and press the soil down around it. Be careful not to cover the crown, which is where the stem meets the root. Covering the crown can cause it to rot. When the seedling is planted, place an identification marker beside it. Plant the seedlings about 18 inches apart, then water them thoroughly. Make sure no water gets on the leaves. Spread a one or two inch layer of mulch around the seedling. Again, make sure that the mulch doesn’t touch the crown of the plant. Make sure to keep the weeds down by mulching around the plants or by simply pulling the weeds up and out. It’s best to destroy weeds while they’re still seedlings, for mature weeds can have roots and rhizomes that are difficult to tear out of the ground. The best time to pull weeds out is right after a rain, while the ground is loose. Water the hollyhock transplants at least once a week to support the roots. The best time to water the plants is in the morning, and the worst time is at dusk. Watering this late in the day encourages disease. When new leaves start to appear on the plant, give it some light fertilizer. As they grow taller, some hollyhocks may need staking to keep them from falling over.